In memory of William H. Coleman. Wilson Daily Times, 17 April 2009. In the 1910 census of Oldfields township, Wilson County: Henry Coleman, 38, farmer; wife Mary J., 28; and children Stella, 13, Willie, 8, Josiah, 7, William, 5, Mattie J., 4, and Sallie, 2. In the 1920 census of Oldfields township, Wilson County: on Old Wilson and Raleigh Road, farmer Henry Coleman, 50; wife Mary Jane, 40; and children Stella, 22, Willie, 19, Joesire, 17, William H., 16, Mattie J., 13, Sallie, 12, Bell, 10, Stephen, 8, Wiley, 7, and Eva, 1. On 27 February 1929, William Henry Coleman, 24, of Old Fields township, son of Henry Coleman and Mary Joyner, married Cornelia Jones, 24, of Old Fields, daughter of George and Martha Jones, in the presence of W.M. Morris of Wilson, and Dave Powell and George Jones of Sims. In the 1930 census of Oldfields township, Wilson County: farmer William H. Coleman, 25, and wife Conelia, 25. William Henry Coleman registered for the World War II draft in 1940. Per his registration card, he was born 15 December 1904 in Wilson County; his contact was father Henry Coleman; he lived at R.F.D. 2, Wilson; and he worked for WD. Boyette. Cornelia Coleman died 19 June 1975 in Wilson. Per her death certificate, she was born 5 March 1905 to George Jones and Martha Jones; was married to William H. Coleman; was engaged in farming; and was buried in Coleman Memorial Cemetery. Studio shots, no. 52: Nancy Coleman Evans. In the 1900 census of Old Fields township, Wilson County: farmer Thomas Coleman, 34; wife Mollie, 24; and children Fannie, 10, Delany, 5, Allis, 4, and Nancy, 1 month. In the 1910 census of Taylor township, Wilson County: on the mill path, farmer Thomas Coleman, 39; wife Mollie, 34; and children Fannie, 19, Lonnie, 14, Alace, 12, Nancy, 9, Johnnie, 8, Esquire, 5, Connie, 2, and Neva and Eva, 2. In the 1920 census of Taylor township, Wilson County: farmer Levi Evans, 23; wife Nancy, 20; daughter Esther Q., 2; and sisters Fannie Battle, 26 and Mamie Evans, 16. In the 1930 census of Jackson township, Nash County: farmer Levie Evans, 33; wife Nancy, 29; and children Esther, 12, Viola, 10, Rachael, 6, D.C., 4, and Harvey, 1. Nancy Evans died 26 September 1937 in Jackson township, Wilson County. Per her death certificate, she was 37 years old; was married to Levie Evans; was born in Wilson County to Tom Coleman and Mollie Wooten of Wilson County. Levie Evans was informant, J.F. Cowan was the certifying physician, and C.E. Artis was undertaker. Photo courtesy of Ancestry.com user rogerbarron52. Tom Wilson – Testified that on one occasion last year he was passing the house of the female def’t Emma Coleman and saw the two defendants lying on the floor on a quilt. One of them Emma jumped up. He did not see what they were doing. Did not see anyone else about the house at that time. Tom is a married man and had been for a number of years. Emma has been married but is a widow. They are not married to each other. That he had frequently seen Tom at Emmas house – in day time – at night and coming away from there in the early mornings – about day brake. He could not say that he saw Tom go there any night and come away the next morning. He had not seen that but there one night and coming away another morning. Louis Strickland – Said that there was a party on old Xmas 1912 night. A number of negroes there including both defts. That they sat by the fire place and Tom felt Emma’s breasts. That he had heard Tom say that Emma was his woman; that he looked out for her and provided for her and that he did not want her wasting his time with any other man. M.H. Lamm – Testified to the dealings in the store. About Tom paying for provisions for Emma and bills charged to Emma amounting to 3.00 or 4.00. J.P. Vick – Testified to seeing Tom coming out of Emmas house in early morning on several occasions. That was during the tobacco curing & also tobacco selling season. That Tom told hom Emma was his woman & that he looked out for her &c.
Sim Batchelor – Testified that one day last year the female def’t asked to ride with him to town on some business and he took her to Wilson & took her home again. That soon after that the male deft asked him what in the h___ he was doing hauling his woman around. Mr. Edwards – Def. Coleman’s gen. ch. [general character] good. Mr. Briggs – Def. Coleman’s gen. ch. good. Thos. Coleman – Emma’s money bought the provisions. She did not understand making change. The path from my house runs right by Emma’s house which I would use in going to the tobacco pack-house. X’d [cross-examined]. The money which paid her bills at the store her own money. I never beat Emma in my life about anything. Emma bought the “Estime” herself & wore it. Emma Coleman – Been the mother of 5 children. 3 living now. My husband was their father. Have never ridden with Mr. Sim Batchelor in my life. Have bought meat & bread from Mr. Lamm’s store. My money paid for it. Lou Gay — Mother of Emma Coleman. Ed, her husband, died 3 miles from where Thos. Coleman lived. Afterwards I lived with her. We lived in the house that got burned. 2 rooms in house we lived in last year; only one bed room. Never saw Tom put his hands on Emma. Mollie Coleman — Wife of male deft. Been married 22 years. Have 8 children. Louis Strickland came to my house in Feb, said do you know what they ketched all those peoples up & carried them off. He said it was about Tom [keeping?] Emma. My husband did not go away from home at night except in tobacco curing time and then not all of any one night. Fannie Coleman — I was at that dance at old Xmas. Am 21 yrs. old. Not married. Have 2 children. Staid 5 weeks last year with my grandmother Wootten. Alice Coleman — Daughter of male def. Remember that old Xmas night. Alphonso Coleman — Present at old Xmas night party. Am Bro of the male def. Justus Coleman — Def. is my uncle. Present old Xmas night. Lena Williams — Daughter of Dallas Williams. Mr. Vick — Recalled. Did Mollie Coleman make any statement to you as to the number of nights her husband had spent away from home during 1912? Def’s obj. over’d. Defts. except. (This evidence offered & allowed only against the male deft.) Mollie about Xmas was talking to me. Said Tom had been at home about 2 nights in the last month. X’s. Ques. Who told you that Tom Coleman said your wife had been selling liquor? State obj. Sust’d. Def. except.Ques. Did not Tom Wilson a state’s witness give you that informantion? State obj. Sust’d. Defts. excepts. Same question as to Carley Holeman, M.H. Lamm, Louis Strickland, Sim Batchellor. R.H. Braswell — Known Tom Coleman 18 years. Gen Char. Bad. Walter Braswell — Same as above. On 24 September 1890, Thomas Coleman, 21, of Oldfields, son of Squire Coleman and Nancy Farmer, married Mollie Woodard, 17, of Taylors, daughter of Ben and Clara Woodard, in Wilson township. Witnesses were J.W. Farmer, John Barnes and Annie Peacock. Edwin Coleman, 20, son of Gray and Harriet Coleman, married Emma Gay, 19, daughter of Henry and Louisa Gay, on 11 October 1899 in Wilson township. In the 1900 census of Taylors township, Wilson County: Eddie Coleman, 24, and wife Emma, 22. In the 1900 census of Oldfields township, Wilson County: farmer Thomas Coleman, 34; wife Mollie, 24; and children Fannie, 10, Delany, 5, Allis, 4, and Nancy, 1 month. In the 1910 census of Wilson township, Wilson County: on Toad Town Path, widow Louisa Gay, 51, farm laborer; son Henry, 25, farm laborer; daughter Emma Coleman, 21, also a widow; and grandchildren Rosa, 7, Bertha, 5, and Frances Coleman, 4, and Lenord Williams, 10. 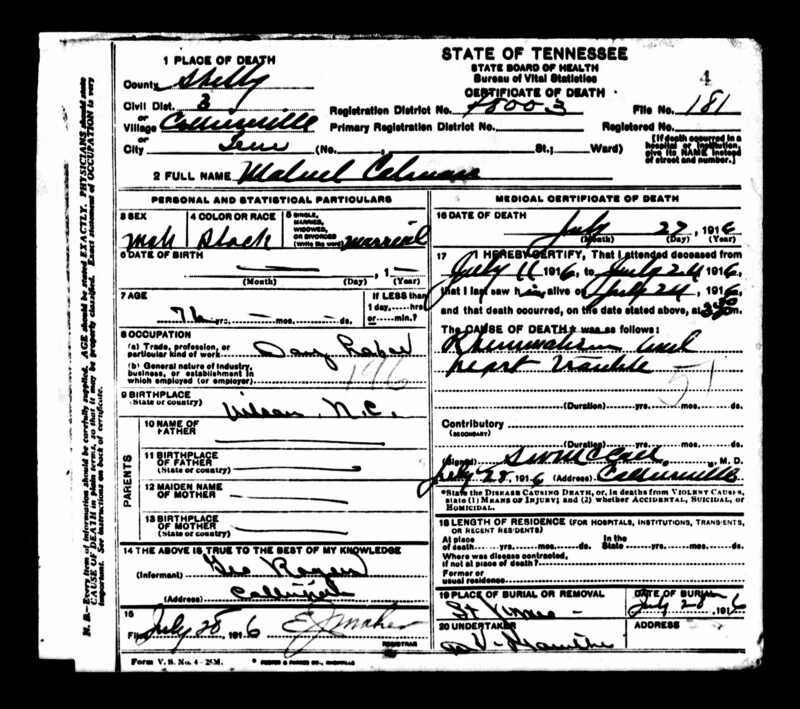 Thomas Coleman died 1 December 1933 in Oldfields township, Wilson County. 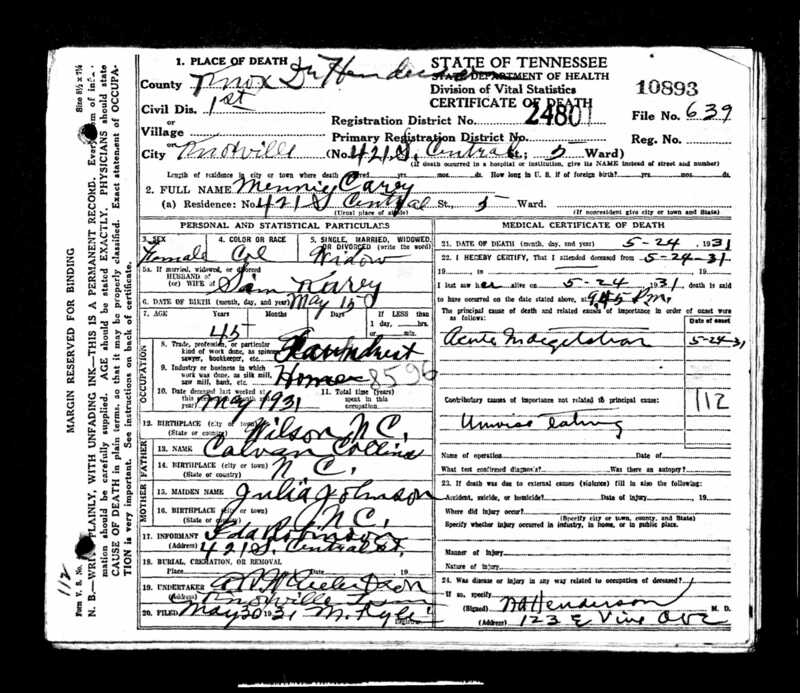 Per his death certificate, he was born December 1862 in Wilson County to Squire J. and Nancy Roundtree Coleman; was married to Mollie Coleman; and worked as a farmer. Fannie Coleman of 115 West Walnut Street, Wilson, was informant. Adultery Records, Miscellaneous Records, Records of Wilson County, North Carolina State Archives. Drunk and froze to death. That Robert Barnes came to his death Saturday night, Feby 23rd, from exposure to cold while under the influence of liquor. /s/ J.K. Leath, W.R. Bryan, J.D. Barnes, G.W. Walls, S.J. Watson, J.M. Taylor. Robert and Mima Barnes — on 3 June 1892, Robert Barnes, 26, married Mima Barnes, 25, at Dr. Woodards’ in Black Creek, Wilson County. Eddie Coleman — perhaps, in the 1880 census of Wilson township, Wilson County: farmer Gray Coleman, 28, wife Harriet, 26, children Henrietta, 4, Lear, 2, and Eddie, 9 months, plus Molly Strickland, 7. In the 1900 census of Taylor township, Wilson County: farmer Eddie Coleman, 20, and wife Emma, 22. Gray Coleman, colored, had a narrow escape from being burned to death on Friday night last. He had retired leaving the fire burning to assist in keeping out the cold, but hardly to the extent that the result proved. Some time in the night he awoke to find to find the house ablaze. After he had gone round the room to wake his children he only had time to get out before the building fell in. The entire house and contents were destroyed with the exception of one trunk which Coleman seized as he made a wild dash for the outer air. Coleman is much distressed over his loss, and especially the death of his four faithful dogs who were burned with the building. Wilson Advance, 21 February 1895. In the 1870 census of Wilson township, Wilson County: farm laborer Squier Coleman, 47, wife Nancy, 36, and children Gray, 18, Mary, 16, Afonzo, 9, Margret, 4, and Thomas, 2, plus Cassa Jordan, 70, Riley Jordan, 7, and Thomas Jordan, 25. In the 1880 census of Wilson township, Wilson County: Gray Coleman, 28, wife Harriet, 26, and children Henrietta, 4, Lea, 2, and Eddie, 9 months, plus Molly Strickland, 7. In the 1900 census of Taylors township, Wilson County: widower farmer Gray Coleman, 51. On 1905, Gray Coleman, 56, married Cary Woodard, 45, in Old Fields township. Gray Coleman apparently died after 1910 and before about 1914, when the state began to require death certificates. His undated estate contains an inventory of his personal property and his widow Carrie’s dower. Ignore the snark, which was par for the course for newspapers covering African-American social and cultural events. This is a fascinating peek into early East Wilson’s social circles. Henry S. Perry — Henry S. Perry (1873-1927) was a native of Lagrange, Lenoir County. He worked as a bellhop, porter and waiter. Centha Barnes — Lucinda Barnes (1881-circa 1909), known as “Cintha” or “Cindy,” was the youngest child of Willis and Cherry Battle Barnes. Rev. S.B. Hunter — Rev. Southey B. Hunter (1847-??) was an A.M.E. Zion minister. Chas. B. Gay — Charles Benjamin Gay (1878-1953) was the son of Samuel and Alice Bryant Gay. Michael Taylor — Henry Michael Taylor (1861-1927), married to Rachel Barnes, was the bride’s brother-in-law. Known as “Mike,”he worked as a drayman. Edward Barnes — Edward Barnes (1869-1912) was the bride’s brother. He was much better known as Ned Barnes and married Charles and Lucy Gay’s sister Louisa Gay. Walter Clark — Walter Clark (1884-??) was the son of mechanic Rhoden Clark and Sarah Hill Clark, who were Edgecombe County natives. The family lived at 606 E. Green Street. Lucy Gay — Lucy Gay was a sister of Charles Gay. She later married John H. Lewis in Wilson. L.H. Jones — Levi Hunter Jones (1877-1961), a native of Hertford County, North Carolina, was a barber. E.J. Tate — Tate was probably a relative of Hardy Tate (1854-1938), a brickmason. Williams Barnes — William Barnes (1879-1917) was also the bride’s brother. Leutha Clark — Alethia Clark (1882-1936) was the sister of Walter Clark. 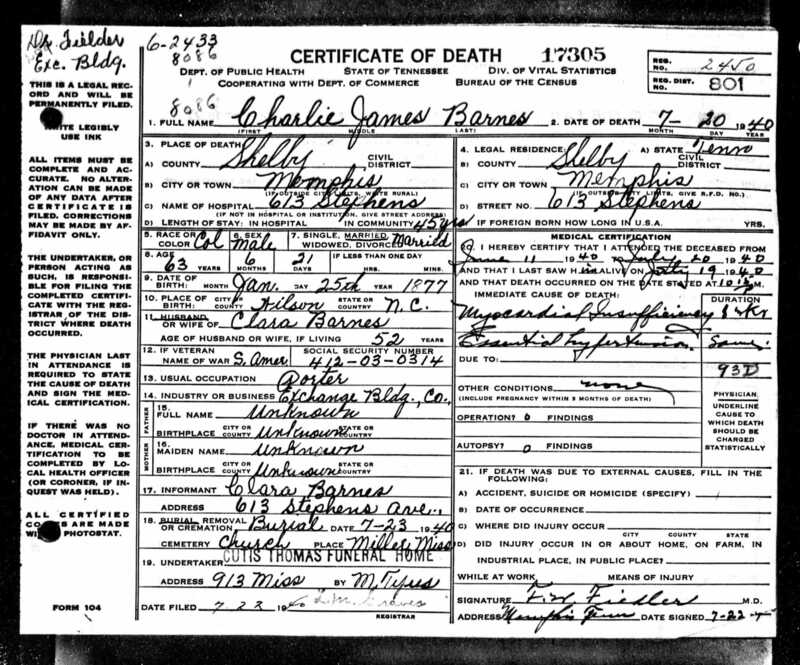 Sattena Barnes — Sattena Barnes (1878-1928) was born in Elm City, Wilson County, to Dublin and Eliza Batts Barnes. She later married John Gaston. William Kittrel — William Kittrell (1875-??) was an Oxford, North Carolina, native and bricklayer. Catharine Clark — Catherine Clark (1880-1933) was a sister of Walter and Lethia Clark. Maggie Taylor — Maggie Taylor (1885-) was Mike and Rachel Barnes Taylor’s daughter. Virginia Dawson — Virginia Dawson (1890-1933), daughter of fishmonger/merchant Alexander D. Dawson and dressmaker Lucy Annie Hill Dawson. Bettie Clark — Bettie Clark (1885-??) was another of Rhoden and Sarah Clark’s children. Lucy Hines — Lucy Hines (1886-??) was the daughter of Della Hines Battle. Glace Battle — Glace Battle (circa 1890-??) was the daughter of Parker and Ella Battle. She later married Timothy Black. Alice Pierce — Alice Pierce (1889-1915) was the daughter of Andrew Pierce and Alice Knight Pierce. She later married Walter A. Maynor. Bertha Taylor — Bertha Taylor (1891-1962) was also Mike and Rachel Barnes Taylor’s daughter. Where did they go? 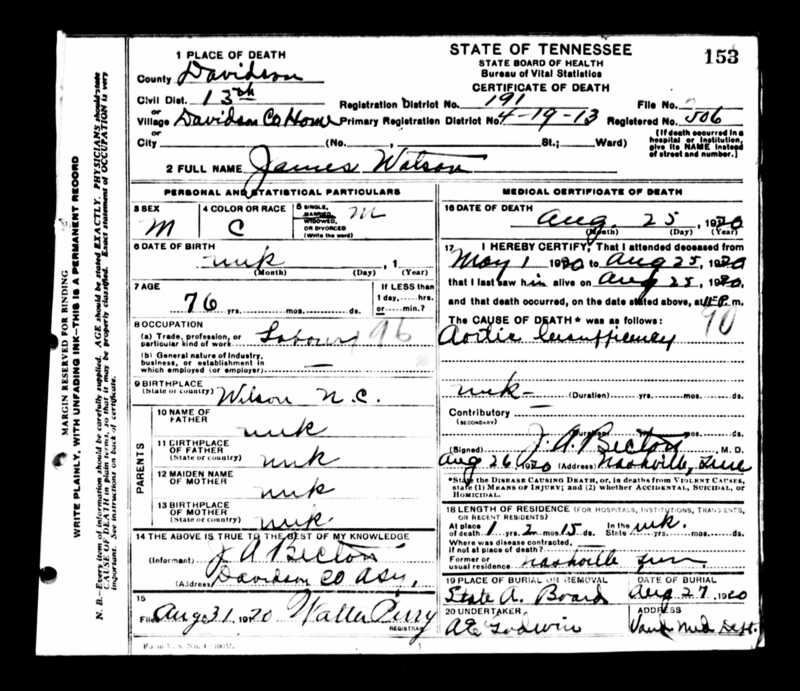 : Tennessee death certificates. In the 1880 census of Wilson, Wilson County: farm worker Samuel Gay, 29; wife Allice, 25; and children Blanch, 9, Louizah, 7, Edgar, 4, Charlie, 2, and Mamie, 1 month. 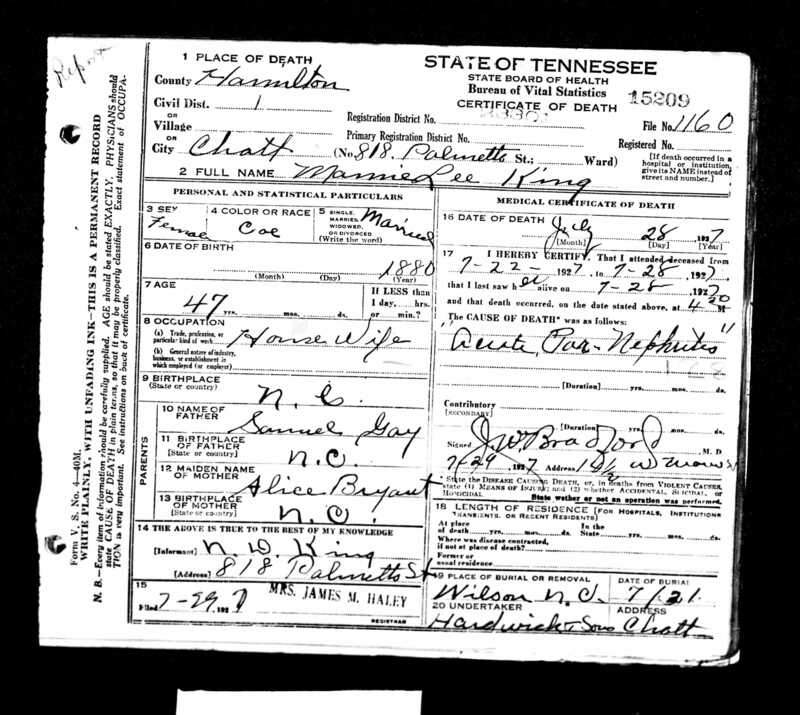 Tennessee Death Records, 1908-1958 [database on-line], http://www.ancestry.com.